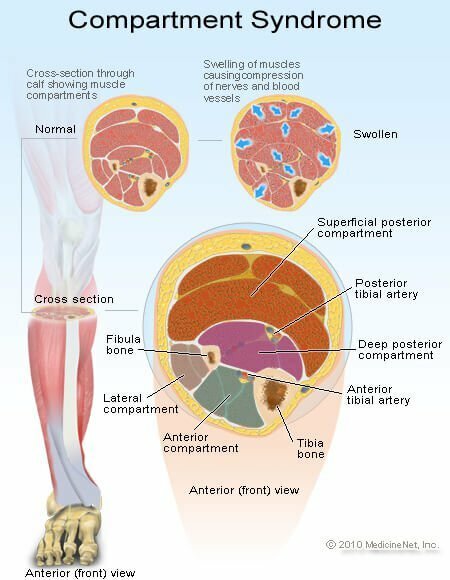 Compartment syndrome: A condition in which there is swelling and an increase in pressure within a limited space (a compartment) that presses on and compromises blood vessels, nerves, and/or tendons that run through that compartment. Hence, the function of tissue within that compartment is compromised. Compartment syndromes usually involve the leg but can also occur in the forearm, arm, thigh, shoulder, and buttock. Some of the causes of increased pressure in compartment syndromes are trauma (for example, a fracture), too-tight wound dressings or casts, hemorrhage (bleeding) into the compartment, or inflammation (carpal tunnel syndrome, for example). Symptoms of a compartment syndrome include numbness, tingling, pain or loss of movement in an extremity. Sequelae (the lasting effects) can include nerve compression, paralysis, contracture or even death. Prompt surgical treatment if it is diagnosed early is the key to successful management. Treatment is to relieve the pressure; if symptoms are severe or prolonged, surgery may be needed.